As I mentioned in my last post, I made a Godawful promise to myself and as a result spent 10 bookless days. Since January is too soon to give up on a New Year resolution and I must stick to it till February at least, I had to write the review and fast. This time I was smart, I wrote the review as I read along. When I got my hands on this 615 pages long innocently titled The Truth About The Harry Quebert Affair by Joël Dicker, to be honest I wasn’t very thrilled. Would you be with a title that long and cover page revealing an empty town? However, once I began I couldn’t stop. Hastily prepared meals, ignored emails and exercise regimes, and feigned ignorance towards the needs of the spouse and kids, I finished the book in two days flat. Well…two days and one all-nighter. If there is one thing I absolutely abhor is the Rubix Cube. I am convinced Erno Rubix invented the damn thing to flummox the likes of me. I manage to solve one colourful (generally blue, since that’s my favourite colour) side and then the all the other sides resemble a punk’s dream come true. In school and college my friends gave up and now my kids have given up on trying to explain the ‘simple’ funda (as they call fundamentals) behind solving it. My daughter when she was 11 shared a YouTube video too hoping I would get it, but NADA. And then the Piramix, astride my Whizkid son’s palm, walked into our home. Let me not even get started on my battles with this Rubik’s cousin from hell. You may be wondering why I’m lamenting on my incapability to handle this ‘simple’ puzzle when the post is about a book deceptively named The Truth About The Harry Quebert Affair. The reason is rather simple (please, detect sarcasm here). Fanny Blake of the Daily Mail describes the book as ‘An expertly realised, addictive Russian doll of a whodunnit’, I cannot find a better expression than hers. Having read whodunnit’s from an early age, there is not much that comes as a surprise in books anymore, and even though I had guessed who had ‘dunnit’ early into the read, Dicker made it tough to say: Aha! I knew it, at the very end. Every turn of the page became interesting as new information was revealed and confused the hell out of me on who would be the inglorious murderer. Joël Dicker can probably solve the Rubik’s cube and the Piramix with a few twists like my progeny, but I’m convinced he also can break it down to its spare parts and join them together without breaking a sweat. For he sure broke the plot of this book down, scattered the pieces, let his pet or offspring run riot over it and then put the pieces back together in the most ingenious novel within a novel. If that isn’t reason enough for you to pick up the book here’s the next. The most fun conversations happen between Marcus and his Mom. To the son’s frustration he just has to say something and the mother twists it into something else entirely, these conversations brought out many a chuckle of delight as I read on. She is the quintessential mother, always questioning all her son’s actions and choices resulting in hilarious conversations with her bewildered child, who needed to get on with investigating a murder, exonerating his mentor and writing a book all at the same time. If I were Marcus, I wouldn’t have lasted, I would marry the first woman I came across just to shut her up. Sarcastic Moms have always been my favourite characters in books and Mrs Goldman lives up to the expectation and more. Need more reasons to read the book? Well, here’s the next. You still need more reasons, right? Phew! Demanding, aren’t we. Well here’s the last one. Every book should leave you with having something you would like to go back to again and here’s one from this one I wanted to share for all those who spend most of their life worrying about reaching the top of the mountain. Amazing, right? So simple, yet a resounding message about what life should really be about. I now gleefully reach out for my next read The Wonder by Emma Donoghue. Watch this space or rather my blog for the review. As a year-end promise to myself, I decided to write a review of every book I read in 2018. To ensure I fulfilled my intentions, I further restricted myself to not beginning another read, before I wrote the review. Phew! Did I set myself a tough one. Any voracious reader will understand how difficult restraint is. Reading is like a drug, I go from one fix to the next with scarcely a break. And here I am like the lawyer in Anton Chekov’s The Bet stuck with my own capriciousness, I sure hope I don’t end up disillusioned like him. The thing with promises we make to others is,- we can get out of them by breaking them with maybe self-righteous justification or disappointed begging-off . However, when one makes a promise to oneself you, or rather me, gets stuck with Launcelot’s ‘hard conscious.’ Now with multiple goodreads lining up my bedside table towards which my fingers repeatedly stretch out, till my promise smacks them away, you can surely understand the predicament I’ve stuck myself with. So, here are my thoughts on the first of the many books I will read in 2018. Based on a notorious adoption scandal involving Georgia Tann, a child trafficker who separated children from their birth parents under the cover of the Tennessee Children’s Home Society, an adoption agency in Memphis, Tennessee. From the 1920s to when the home was shut down in 1950, Tann perpetuated numerous adoption frauds. To the public Tann was the acclaimed ‘mother of modern adoptions’ consulted even by Eleanor Roosevelt and feted by the rich and influential. She owned a mansion, threw lavish parties and roamed around Memphis in a chauffeur driven Limousine. To the families whose children were taken away, Georgia Tann was their worst nightmare come true. For all who were taken by her were not unloved orphans, but infants taken away from unwed mothers who were told their children were born dead, kidnapped toddlers from their doorsteps or when they were on their way from school, snatched children from destitute people claiming they were unfit parents, and the list goes on. The children were then sold to wealthy families via advertisements in newspapers with catch lines like “Yours for the Asking” and “Perfect Christmas Presents”. Over thirty years Tann got away with her despicable acts with the promise that the children “They are blank slates. They are born untainted, and if you adopt them at an early age and surround them with beauty and culture, they will become anything you wish them to be.” There is much more to the sordid story of Georgia Tann, but then the book is not about her, it is about the lost children of Tennessee. Before We Were Yours is a fictional story straddling the past and the present. The past is of 90 year-old Rill and her siblings who were torn by Georgia Tann, from the loving arms of parents who were poor, yet the children were loved. The present is Avery Stafford who looks uncannily like Rill’s sister Fern. The story speaks of an old woman who due to Alzheimer’s is losing her memory and her sister who remembers too much. It is about a family which has too much to lose if the truth gets out and about women who do not want to disrupt the lives of those they cherish. Wingate’s novel is also about a young woman who has to make many choices about her life, her career and the man she should marry, and each choice, as often in life, is tough and will hurt those she cares for the most. I love to read and often beyond a beautiful story I get mesmerised by an author’s skill at weaving words which pierce through my very soul. As I read a book I mark these to go back to and feel them again and again. Here are some by Lisa Wingate that will hold me in thrall for a long time to come. Beautiful are the words that “Before We Were Yours” is adorned with. Read the book for the story which is a heartbreaking tale of survival or for the words with which Lisa Wingate shares this poignant unravelling of the adoptees who never forgot. And now since I have accomplished the first review, I’m going to pick up my next read – The Truth About The Harry Quebert Affair by Joel Dicker. Watch out for the review very soon. Courage in traditional literature was a word reserved for the battlefield and predominantly for a few men of valour, the others and women were considered too weak to walk the arena that courage inhabited. Modern and contemporary writing has (thank heavens) redefined the word taking it out of the bivouacs permitting lesser mortals to lay claim to its attributes. Singh’s debut novel ‘A Window To Her Dreams’ is all about courage, this elusive quality of mind that enables a person to face challenges that in the strife of life is faced by many. The story grows with the spirit of her protagonist, Aruna, who fights demons of her past with fear at first and then with the confidence that love brings to her, eventually overcoming the wounds inflicted on her soul. This book is a realistic take on a contemporary marriage that requires the equal participation of a man as well as a woman to make it work. It is also about the sensitivity of men often overlooked with the need to portray them as either invincible heroes or formidable villains in stories that aspire to showcase the strength of a woman. Here Singh deviates from the norm and creates Bhuvan, a sensitive male who has the quiet inner strength that is found in the many contemporary men who make their marriages work. Singh’s, Bhuvan is a giant with a heart of gold, he is complex and at the same time so simple that he wins the reader’s heart from the get go and holds it firmly in his hands to the very end. Aruna’s anguish and the dark clouds of her past influencing her present comes out so strong that despite having never experienced her pain the reader not only identifies with her, but roots for her to the very end. The book like western audiences would expect is not just about the two protagonists and a marriage. In India, marriage is just not a union between two, it is a balancing act of infinite proportions between families and here Singh manages like a Maestro to bring on a symphony of complex characters. A distanced father dealing with his own insecurities, one estranged sister, another a clairvoyant, a set of triplet sisters with blossoming personalities and a brother who is struggling with the expectations of family and his own ambitions. Strength there is in all the characters that builds up a family that is both flawed and remarkable in their ability to hurt at the same time heal with each other. Then you have Uma, Aruna’s mother the anchor that holds her large imperfect family together with tenacity, not that surprising as it is reflective of many Indian families. The narrator surprisingly is an old ‘Haveli’ that surely has the character to speak about the family it has sheltered through various storms within and without. An inanimate whose existence is inextricably linked with the people it houses. Some questions that Singh leaves unanswered niggle at you long after you’ve put the book down. The mysterious figure of uncle Suresh, what are his feelings for Uma? And what does the Haveli hide that is known only to Uma? More often than not writers build up their protagonist to make them larger than life inspirational, I was glad to notice that Singh does not do that. Sometimes stories should be just that about commonness and embracing it. 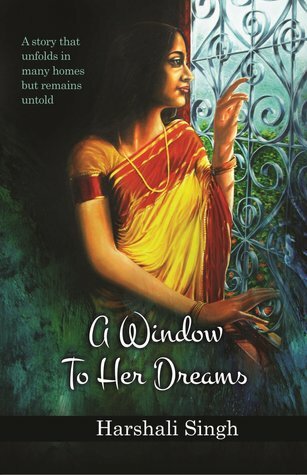 Where the book falters is in its editing and proof reading which is sloppy and jarring but once you get past that the story within ‘A Window To Her Dreams’ by Harshali Singh establishes her as a writer worth reckoning. As I read through Tabrez’ dedication and acknowledgement, I had an inkling that the story about to unfold was one I would like. And I not only liked it, I loved it! We all see and feel the ugliness in the world yet are hopeful of the innate goodness out there; this is the book that reiterates your faith. It is a celebration of human relationships. This book “In The Light of Darkness” the debut novel of Radhika Maria Tabrez, published by Readomania is a must read.